This week in the PoolDawg Academy, we are sharing an excerpt from one of our favorite instructional books, Phil Capelle’s Play Your Best Eight Ball. 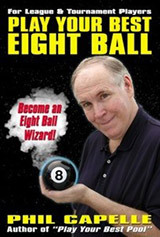 In that book Phil breaks down everything you need to become a solid Eight Ball player. Today, we’re going to take a look at a part of bar box Eight Ball that can be a real challenge: dealing with clusters. Let’s jump in! You who are mathematicians (and hopefully the rest of you as well) should appreciate this: when all 15 balls and the cue ball are on the table, they take up 63.62 square inches of the 3,200 inch playing surface of a bar table. Each ball occupies only 3.98 square inches. And yet, amazingly enough, the balls can’t seem to stay away from each other as they tend to congregate in small areas and create clusters. According to my Dictionary of Pool, a cluster is a group of two or more balls that prevents one or more balls in the group from being pocketed. Now it’s easy to hate clusters, but bar table Eight Ball is a game of clusters. So from now on, if you love Eight Ball, then you love clusters as well. While these problematic groups can thwart your runouts, they also perform the same duty for your opponents. If clusters didn’t exist, everybody would run racks and Eight Ball would be as fascinating as bowling. Ouch! So we must thank the Pool Gods for clusters. They add interest to the game, and knowing how to handle them gives you a way to rise above your competition. The Big Idea: The key to breaking clusters is controlling the cue ball’s path after it contacts the object ball.In this section we’ll cover three methods for controlling the cue ball’s path to a cluster. The cue ball’s path to a cluster is regulated like its path on a position route. You need to be concerned with cueing and speed. However, the cue ball’s distance from contact with the object ball to a ball cluster is generally much shorter than most position routes. Focus on the cue ball’s initial path after contact. Controlling the initial path after contact will enable you to break clusters with a diamond cutter’s precision. It will also help in sidestepping the 1,001 potential disasters that threaten the haphazard practitioner of the cluster busting arts. Using the Tangent Line to break up clusters of billiard balls. A book entitled Tangent Lines in Pool 101 could be written because tangent lines have so many uses, among them precision cluster busting. In Part A, the cue ball rolled down the tangent line toward the middle of the cluster after a stun shot off the 1-ball. A stun shot played with centerball and a medium stroke creates the desired path. When you have a potential break ball like the 1-ball, peer down the tangent line from Position Y. If the tangent is directly in line, a stun shot will result in the perfect break. In part B, the tangent line runs between the two clusters, which can be seen from Position Z. A draw shot will send the cue ball down Path B-1 into the cluster with the 8-ball. A follow shot will bend the cue ball into the 3-6-ball cluster down Path B-2. In both cases, the tangent line served as a useful point of reference for plotting the cue ball’s route to the clusters. Angle of Departure can be used to break a cluster of billiard balls. The cue ball’s path after contact is very predictable when a cut shot is played with a very soft stroke. In Part A, if Cue Ball A struck the 1-ball softly, it would travel down Path A. The angle between the 1-ball’s path to Pocket A and the cue ball’s path after contact is the Angle of Departure. As the cut angle grows, so does this angle. Notice the much wider angle of departure when the 1-ball has been cut from Position E.
Part B shows how the Angle of Departure can be used to break a cluster. A 30-degree cut shot on the 6-ball produces a 67-degree Angle of Departure. The travel line leads directly to the three-ball cluster. The Angle of Departure should be used when a soft hit can separate a cluster, which is almost always the case for clusters with three balls or less providing they are not wedged against a cushion. The Angle of Departure can also be used as a reference line. If the line points below a cluster, you can still break it by adding some speed to the shot. For example, if the stripe, 2, 3-ball cluster was positioned slightly further from the end rail, you could hit it by using a little more speed on the 6-ball shot. You could not, however, break the cluster if it was on the rail next to where the 2-ball now resides. Breaking clusters of billiard balls off the rail. Controlling the cue ball’s path off a rail can be super easy or a major challenge. It all depends on the cut angle and the object ball’s distance from the rail. Cue Ball A in Part A below shows the ideal scenario for breaking off one rail. The cut angle is steep, but not overly so. The 2-ball’s proximity to the rail also makes it easy to control the cue ball’s path. The shot is nearly the same with Cue Ball B, only this time a half tip of follow is required to pull the cue ball into the cluster. In Part B, the 3-ball is about three inches off the rail. With the cue ball in Position A, it takes a half tip of left english to send it into the cluster down Path C. When the cue ball is in Position B, there is a strong tendency to miss the cluster to the high side shown by Path D. These cluster breaks and others similar to them require lots of practice. We hope you enjoyed this excerpt! This great book and Phil Capelle’s other offerings can be found in the Instructional Books section of our website.